MX-17.1: Safely connect a notebook's heaphone output to "tape in" - how? I have a notebook here, which, as most do, only has a 3.5 mm headphone socket. It looks like this one: https://en.wikipedia.org/wiki/Phone_con ... _3.5mm.jpg. AFAIK those standard three-contact consumer plugs are also called "TRS connectors" (wherein "T" stands for "tip", ""R for "ring" and "S" for "sleeve"). Now I would love to connect the notebook's headphone socket to an old "PHILIPS SOUND PROJECT ZU7 66 RH 891 Stereodecoder" Hi-Fi set (looks like this one: http://www.busby.co.uk/public/images/sa ... 018/68.JPG). These old high-quality Hi-Fi sets are frequently being thrown away or sold for a few dollars, probably because people don't know how to connect their modern devices to them. The only way of getting external audio into this machine is an old socket labelled "TAPE". 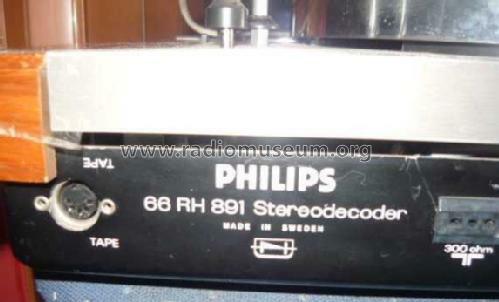 You can see it on the left side of this: https://www.radiomuseum.org/images/radi ... 672903.jpg foto. I have identified this as being a 5/180° DIN connector socket (see https://en.wikipedia.org/wiki/DIN_conne ... alog_audio). Marginal note I: I'm not quite sure why the socket is for five pins. Maybe the Hi-Fi set features both "tape in" and "tape out". I wouldn't know what the fifth pin is any good for, however. https://en.wikipedia.org/wiki/DIN_conne ... alog_audio mentions "Screen/return" as a function for pin #2. I have no idea what this is supposed to be. Marginal note II: As far as the connection cable quality is concerned, I've heard that it's important to use a "balanced audio" quality whenever possible. Anyway, my main question is: How can I safely connect the notebook's headphone socket to the Hi-Fi set's "TAPE" socket? AFAIK "headphone outputs" provide a lot more power than expected by any "tape in", and the impedance is be wrong. (I'm assuming that "tape in" is the same as "line in". Please correct me if I'm wrong.) To my knowledge, these old machines don't like receiving too much power and the wrong impedance and have a tendency to get broken if they do. Use something similar to the Automatic volume limiter system (AVLS) that can be found in some headphones. Seems that in the professional audio world there are systems called "Direct Input units" ("DI units", cf. https://en.wikipedia.org/wiki/DI_unit) that might do the job. Don't know if that is exactly what would be needed - does anyone know? An example for a DI unit is the "ZDirect Professional Passive Direct Box" by U.S. company ART (http://www.artproaudio.com/product/zdir ... irect-box/). Let the operating system (MX-17.1) tell the notebook's sound D/A converter never to exceed a certain amperage, and/or voltage, and never to go below a certain impedance. Don't know if MX-17.1 can talk directly to the D/A converter in order to achieve that. Any input on this topic will be greatly appreciated. Re: MX-17.1: Safely connect a notebook's heaphone output to "tape in" - how? You use pavucontrol or alsamixer to configure the jack to be Line Out and connect with one of these cables. The line out setting for sound cards is designed for that purpose and I use the line-out in a micro-itx computer to drive my stereo system (though mine uses rca inputs instead of DIN so the cable is different). I run mpd on that machine so all my music is available from any of the devices on my network. You use pavucontrol ... to configure the jack to be Line Out (...). How would I do that? I can see no such option (MX-17.1, pavucontrol 3.0-3.1). Well, here is where I meant - and I remember this working on my old (now dead) Lenovo. But my HP laptop, the line-out jack is only available on the docking station (which I don't have). So it's not as simple as I thought. If you install alsa-tools-gui there is a utility hdajackretask to remap the jacks so your headphone jack or microphone jack could be the line-out instead. This doesn't work on all hardware (and it fails to connect Line Out to either on my Probook 6475b) but it does work for others so it's worth a shot. In any case, the headphone output is very unlikely to damage an old amp. Line Out may run at about 0.3V rms - but those old amps were designed to work when an old crystal cartridge turntable was plugged in and they ran around 2.5V. You laptop will likely output between 0.5V & 2V. In any case, 3.5mm jack attenuating cables are readily available if you're worried about it. Maybe the pavucontrol way of remapping the audio sockets requires that you have one of those modern combo sockets that can function as headphones-out as well as line-out as well as microphone-in jacks? Interesting tool, thanks. Is it any dangerous to use it - could this possibly destroy the D/A hardware? Neither do I have any color-coded sockets, nor do I have any on the rear side. I have indeed more than one time seen a similar old stereo getting damaged by having been connected directly from notebook-headphones-out to line-in. I guess what you say is correct for a classic (stand-alone) amplifier, as they probably are more tolerant than those combo Hi-Fi sets, but please consider that the Hi-Fi set in question already has a turntable built-in, so it might not expect getting high power via the "TAPE"-in. Good idea. Couldn't really find any that wouldn't have a TRRS type of audio plug, however. What would be needed would be TRS. What do you think about the above-mentioned "ZDirectProfessional Passive Direct Box" (http://www.artproaudio.com/product/zdir ... irect-box/)?